The Kensington Runestone is still not real: 'America's Lost Vikings' episode 4 – AiPT! The biggest stretch for this series yet. Episode four of America’s Lost Vikings on Science Channel has come and gone. This will probably be the shortest review I’ve done so far, because there are only two major issues covered. It really doesn’t matter if Blue Nelson and Mike Arbuthnot can row a Viking replica boat up a frozen river, there’s absolutely no evidence to suggest that the Norse were in Minnesota. We begin with Nelson and Arbuthnot bantering about a mysterious artifact that could prove that Vikings made it to the Midwest. The title of this episode is “Ghosts of the Great Lakes,” and I guess they’re talking about 10 imaginary Norsemen mentioned on the Kensington Runestone. As soon as my guess was confirmed, I had to turn the TV off for a long time. There is only one serious archaeologist I can think of that even suggests we should be open-minded about the Kensington Runestone; no one else thinks it’s real. 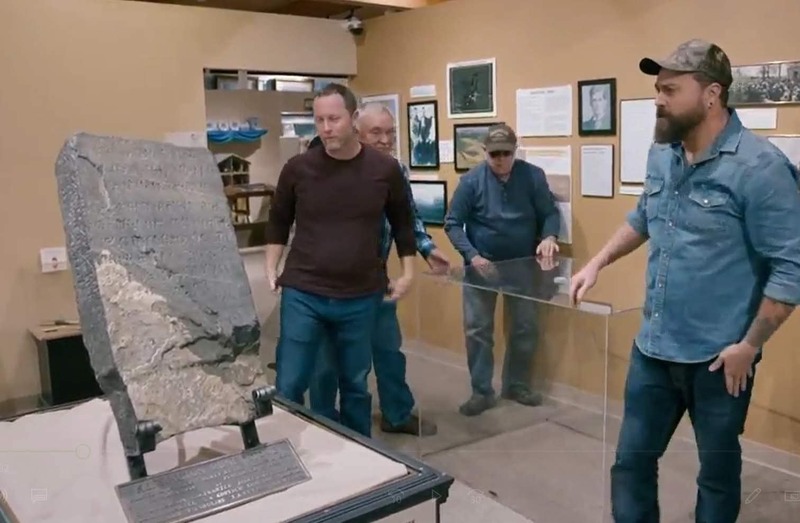 The quick story of the Kensington Runestone is close to what the show gave us. There are several variations, but the common thread is, in 1898 near Kensington, Minnesota, a Swedish immigrant farmer named Olof Ohman and his son found a stone tangled in the roots of a tree they were removing from a field. They didn’t even notice the carvings until much later, after the stone had been left to sit in the field and Ohman’s son had dug the dirt out of the inscriptions with a stick. From there, things get difficult to keep track of. There have been some excavations in the area and nothing has ever been found that might be associated with the stone, no Norse artifacts of any kind. The inscriptions have been examined and have been found to be a mix of several different runic alphabets, which wouldn’t be true if the stone were authentic, and the overall design is unlike any other runic stone ever found. Yet we spend the first quarter of the show trying to see if the stone is real or not. Interestingly, Nelson and Arbuthnot managed to further prove the Kensington Runestone isn’t real, first with their scans of the carvings, which we’ve seen done on other shows like Unearthed America, then with their own attempts at carving runes into the same kind of stone. Neither of these activities can prove the authenticity of the stone, but I’m pleased the stone-carving exercise helped clear some questions up for Arbuthnot. This is a crap argument and Nelson should know that. Yes, it’s true that at any campsite, unless there is some random bit left behind like a projectile point or bit of pottery, identifying who the campsite belongs to is difficult. However, large groups of people, traveling long distances, always leave trash behind. The Kensington Runestone mentions a larger camp, the death of 10 men, and even more men to discover the dead ones. There’s never been any kind of evidence to corroborate this account. Not 10 graves, not the debris and rubbish generated by a larger group of people traveling across the country, no boats, no items lost off belts or out of packs. What we do find in the area is lots of evidence of indigenous people, and therefore any campsites that are identified in the area are much more logically associated with them, not Norsemen. Still, Arbuthnot pulls out the old “Well if we can do it, so could the Vikings,” which brings me back to what I said about the last episode. Just because they had the tech and know-how to do something, doesn’t mean they did it. The only evidence we have of the Norse in the Americas is L’Anse aux Meadows, and that’s it. And that’s episode four. We start off looking at a fake artifact and then watch Nelson and Arbuthnot learn how to camp. I honestly don’t have much else to say. Nelson and Arbuthnot basically debunk the Kensington Runestone again, and then it’s all just speculation after that. I leave you with a picture of Nelson and Arbuthnot in another Norse replica boat, because Norse boats are cool.